This is a post about giving, whereas I will give something if you give something. 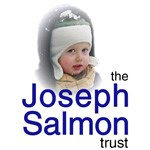 If you look on my sidebar, you'll notice that I've been sporting this badge for the last 8 months about The Joseph Salmon Trust. This fund is being sponsored by my good friend Dan who has taken the initiative to help raise money for his good friends Neil and Rachel. Two years ago our friends Neil and Rachel’s three year old son, Joseph, passed away in his sleep. This year they set up a charity in his memory. Grieving families have enough to deal with without worries about where they will find the money to say goodbye to their child. The Joseph Salmon Trust will give financial assistance, helping pay for things like the funeral and the gravestone. In response to this tragedy, Dan has organized a charity walk where he and 9 of his friends will walk 78 miles next week to raise money for this worthy cause (must resist temptation to do Pounds/mile joke). Please stop by here and here to read more about it. To date, through the generosity of bloggers like you, Dan has raised nearly $4000! This is indeed a great thing, but he would really like to make his target goal of $5000. 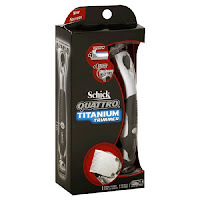 Everyone who donates $10 or more to the Joseph Salmon Trust here will get entered into a drawing for a brand new Schick Quattro Titanium Razor/Trimmer. Anyway, this is a $12 value so a $10 donation is actually a deal. Just leave a comment that says you've contributed and I'll put your name in the hat. So there you have it... you give, I give - just like the title says. I will appreciate it and Dan will appreciate it. But Neil and Rachel will appreciate it the most. Well Dan, if nobody else replies this beauty will go to you! Besides, it sounds like you're in need of a good manscape anyway. Good luck to Dan and everyone else that are partaking in the walk. I hope that the weather cooperates on the walk. Good cause Jeff, and I would give more if I had it. Jeff: Would you forward $10.00 from Lois and me, and I will mail you two checks. One for the fundraiser for $10,00, and one for $100.00. The second check is from your cousin Jeff Guite, and is for Austin and his skatepark fundraiser. He is also sending Austin one of his disaster kits to be used for a raffle. This is indeed a very worthy cause, and I am donating BUT! No need to enter me in the razor giveaway. It's a cool razor but I use Nair. Some scars never heal . . .
bill - I'll do that. Thanks for your donation and please tell cousin Jeff the same thing. sam - It must be that ginger beard he sports eh? jd - Thanks a ton JD. You're the best :-) BTW, if Nair works so well shouldn't I be using it on my face?